Valentine’s Day is in the air and just around the corner. It still isn’t too late to order something special from Ruth’s Toffee so you can be everyone’s sweetheart. Toffee is always a treat, but since not everyone likes toffee you could get fudge, truffles, and Ruth’s Giant Turtles are always welcome. Our special this season is Free Gift Wrapping, as shown here. 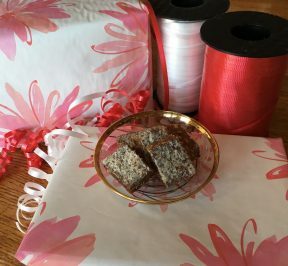 Every order received before 02/14/17 will be giftwrapped, as shown. No need to request wrapping, it will just be included. Order Ruth’s Toffee and don’t be Ruthless this Valentine’s Day.